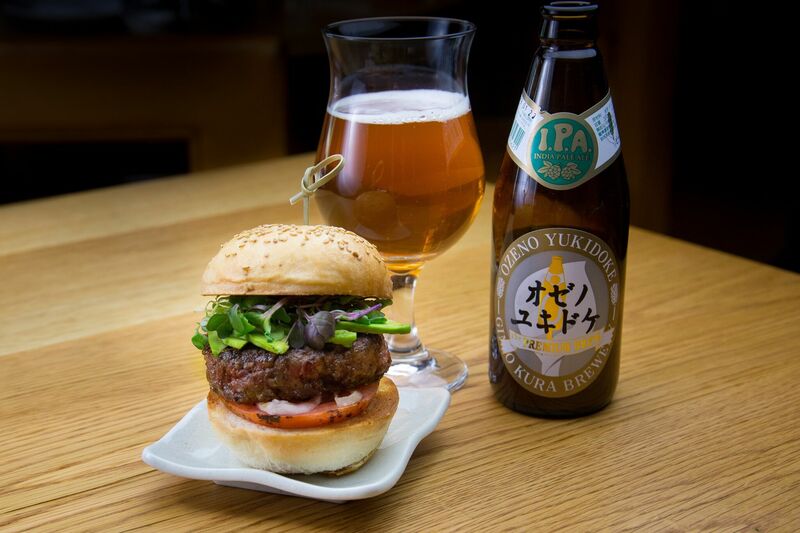 The Chibi Burger and a beer at Roka Akor. Photo courtesy of Roka Akor. The daily grind can be hard and sometimes unwinding after work with a tasty cocktail or glass of wine makes it all seem easier. We put on our “drinking cap” and put together a list of some of the best happy hours in the Upper Kirby and Greenway Plaza area. Clearly it’s a great area for happy hour at Japanese restaurants; three made our list. Another restaurant offers Italian wines at some pretty fantastic prices per bottle. Like our previous lists for River Oaks and the Galleria, there was a lot of ground to cover in this round up. If we didn’t include one of your favorite spots, be sure to let us know in the comments! Please note: this list is organized alphabetically, so be sure and check out all the entries to find the ones that are either most convenient or that offer exactly your preferred kinds of deals. There are also several bargains offered on specific days of the week. Tuna nigiri at Aka Sushi House. Photo courtesy of Aka Sushi House. Aka Sushi House, 2390 West Alabama: This long-time staple in the happy hour scene is known for its regular and reverse happy hours as well as an all-day version on Saturdays and Sundays. 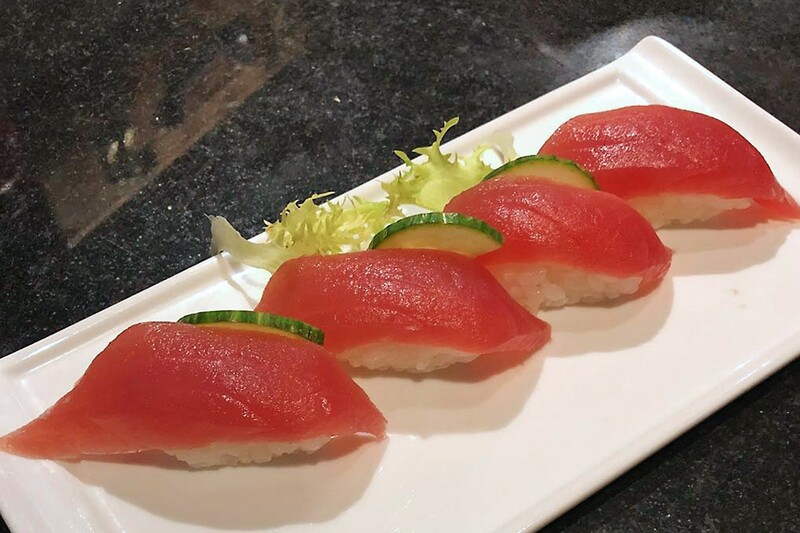 The regular weekday happy hour is from 3 to 7 p.m. Mondays through Fridays and features select rolls for $4 to $7, selected sushi for $5 to $7 and an array of other small bites ranging from $3 to $9.50. Drinks include $5 hot sake, $4.50 house wine and $5 sake cocktails. Aka Sushi House also offers a weekday reverse happy hour from 9 p.m. to close that features the same specials as well as on the weekends from open to close. Happy Hour Dining at Beckrew Wine House. Photo courtesy of Beckrew Wine House. Beckrew Wine House, 2309 West Alabama: This Italian- and Spanish-influenced wine and espresso bar popped up in the former Tasting Room spot. With an ample wine selection featuring several wines by the glass in both three-ounce and six-ounce pours and a decent-sized menu with smaller items like Marcona almonds and truffle-Parmesan popcorn, larger items like freshly made flatbreads and paninis. 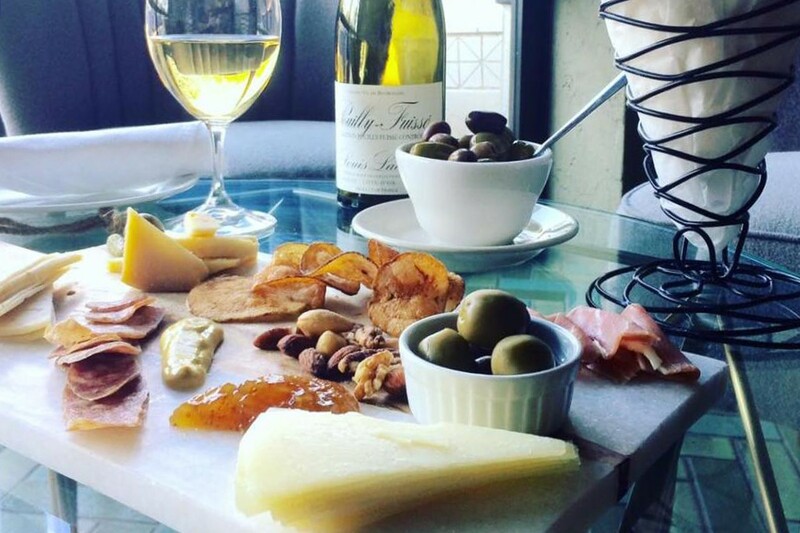 Beckrew Wine House‘s happy hour runs from open to 6 p.m. Mondays through Fridays with $6 glasses and $29 bottles. In addition to the wine specials, every bottle comes with a complimentary margarita flatbread. For those looking for additional munchies, truffle fries, onion rings and the above-mentioned popcorn are all only $4. For beer lovers, draft selections are only $2 each. 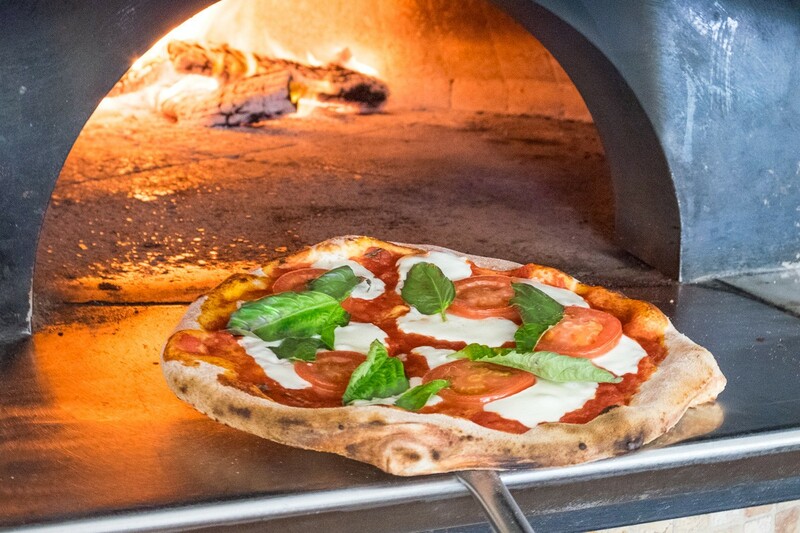 A margherita pizza emerges from the wood-fired oven at Bollo Woodfired Pizza. Photo by Phaedra Cook. 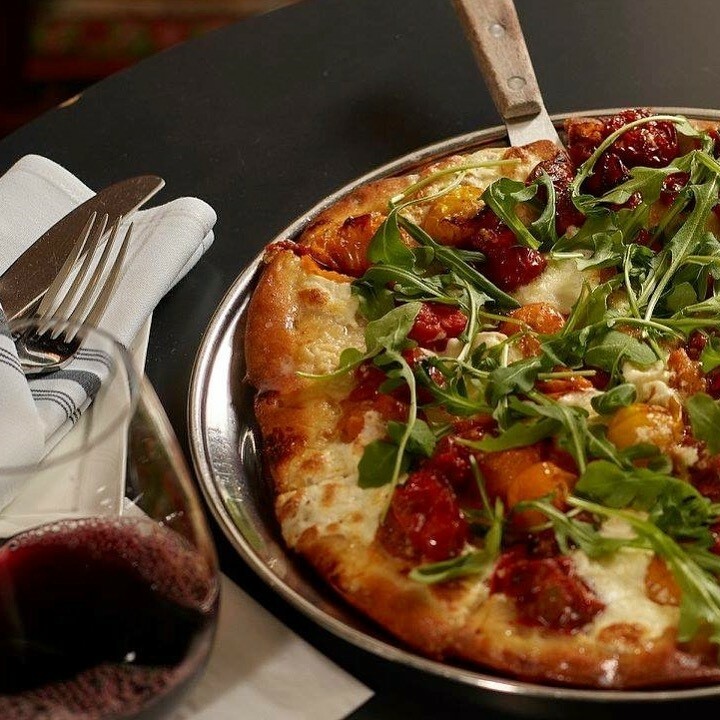 Bollo Woodfired Pizza, 2202 West Alabama: Home to woodfired pizza baked to crispy perfection in an 800-degree oven, Bollo Woodfired Pizza offers revelers both a regular happy hour every day from 4 to 7 p.m. and Reverse Happy House from 9 p.m. to close. In addition to the regular menu, diners can get a bottle of wine or a pitcher of beer and a whole pizza for just $19. While the reverse happy hour is in the bar area only (Bar Bollo), the regular happy hour can be enjoyed in the entire restaurant. There’s also a big, wraparound patio that’s perfect for summer dining. Happy Hour Options At Kata Robata. Photo By Julie Soefer. Kata Robata, 3600 Kirby: Kata Robata is a favorite among foodies for its elevated and inventive Japanese cuisine. 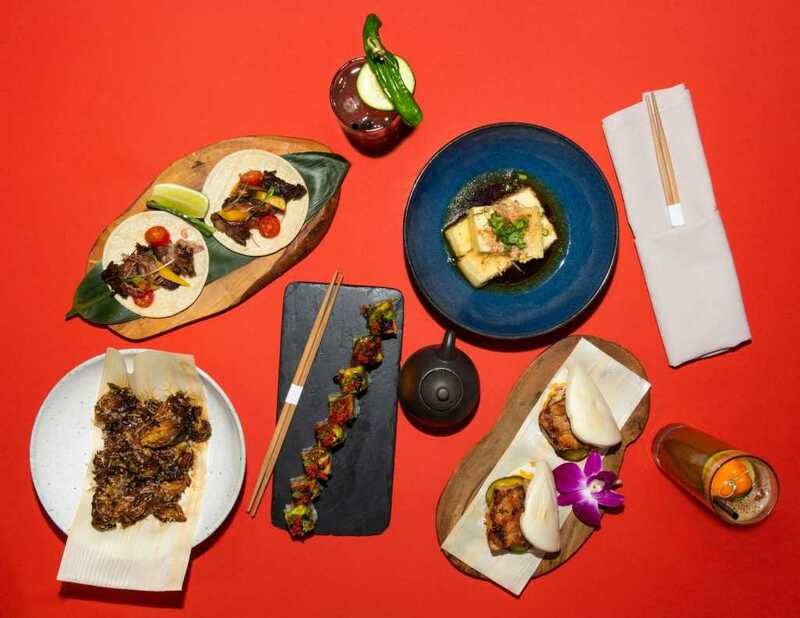 Although dining for dinner at Kata can be pricey, the happy hour Mondays through Fridays from 5 to 6:30 p.m. and 12 to 5 p.m. on Sundays is a deal. It’s only an hour and a half long, but items like Yuza Salmon Carpaccio, Kobe Beef Tacos and the catch of the day ceviche are worth not missing. (Get there early to score a seat in the bar area.) Most happy hour plates are less than $8 and signature rolls like the Longhorn are only $9 each. Regular happy hour drink specials include all $12 cocktails for $6 each, hot sake for $5 and selected red, rosé and white wines for only $6 each. Other daily drink specials include half price on all wines by the glass on Mondays, half price sake flights on Tuesdays, Bartenders Choice on Wednesdays and Fridays, half price Ashahi drafts on Thursdays and Saturdays and mimosas for $3 on Sundays. Cardamom & Basil Gin and Tonic at Kiran’s. Photo By Shannon O’Hara. Kiran’s Houston, 2925 Richmond: Chef Kiran Virma has been serving up her take on traditional Indian food at their Upper Kirby spot since moving to the new, opulent restaurant in early 2017. For those looking to spice up happy hour, Kiran’s offers eleven bar bite options to choose from that range from $5 to $16. These include tandoori chicken satay for $6, Papadam Nachos with lamb for $8, a variety of stuffed naans for $5 and even an ample cheese plate for $16. Select beers are $3 and wine is $8. The creative signature cocktails are not discounted (but are quite good); selections like the Cardamom & Basil Gin and Tonic and the Rose Martini on Kiran’s 2.0 drink menu cost between $9 and $12. Happy hour is from 4 to 7 p.m. Mondays through Fridays. Mia Bella Trattoria, 3773 Richmond: Mia Bella’s second location is housed inside this recently built strip center on Richmond. A large space with lots of parking and patio seating with couches, Mia Bella hosts happy hour Mondays, Tuesdays and Thursdays from 2 to 6 p.m. and on Wednesdays and Sundays from 2 p.m. to close. The regular happy hour menu includes bellinis, sangrias and a Campari spritz for $3 to $4 each and house red or white wine for $4 a glass. Small plates run from as low as $3 for vegetable antipasta. Smaller sized plates like steamed mussels, smoked duck ravioli and the daily, freshly baked focaccia are $6. Mia Bella also runs specials almost every night of the week: Pasta Night Mondays, half-priced select bottles on Tuesdays, $20 for a bottle of wine and two small plates on Wednesdays, steak night on Thursdays and a reverse happy hour on Sundays until closing. Oporto Wine Cafe, 3833 Richmond: Situated in a seemingly nondescript strip center on Richmond, Oporto Wine Café has one of the largest Portuguese wine selections in Houston along with several Mediterranean inspired petiscos. Happy hour runs Mondays through Fridays from 3 to 7 p.m. at the Richmond Avenue location (they also have one in Midtown). Drink specials include 15-percent off all bottles of wine, $6 caipirinhas, caipiroskas, margaritas, mojitos and well drinks. House red, white and sparkling wine, as well as sangria, are also $6. Food specials include a dozen tapas all for $6 or less, such as smoked salmon crostini, piri piri chicken wings and grilled chorizo with romesco. All pizzettes are also half off. Pizza Solario, 3333 Weslayan: This intimate Italian and pizza spot often goes unnoticed, as it almost looks like its part of the apartment complex above it. Pizza Solario actually serves up wood-fired, Neapolitan-style pizzas made in house. Happy hour runs every day from 3 to 7 p.m. with $2 off all wines by the glass and $3.50 draft beers. In addition, there are also daily specials such as any pizza plus a bottle of wine for half price on Mondays, $3.50 beer from open to close on Tuesdays, Deloach Pinot Noir bottles for $25 all day Wednesdays, Skyfall Merlot bottles for $25 all day Thursdays, all “big and bold” red bottles of wine for $25 all day Fridays and Saturdays, and Miontetto Gold Prosecco for $25 all day on Sundays. For a sweet conclusion, scratch-made chocolate chip cookies are only $3 each. Rim Tanon Happy Hour Fish Cakes. Photo Courtesy of RIm Tanon. Rim Tanon, 2241 Richmond: Looking for some authentic Thai street food for an after work happy hour? Rim Tanon is tucked away in the cobblestoned area just off Richmond past Revere. It’s operated by the same folks who own Thai Cottage and Time for Thai. 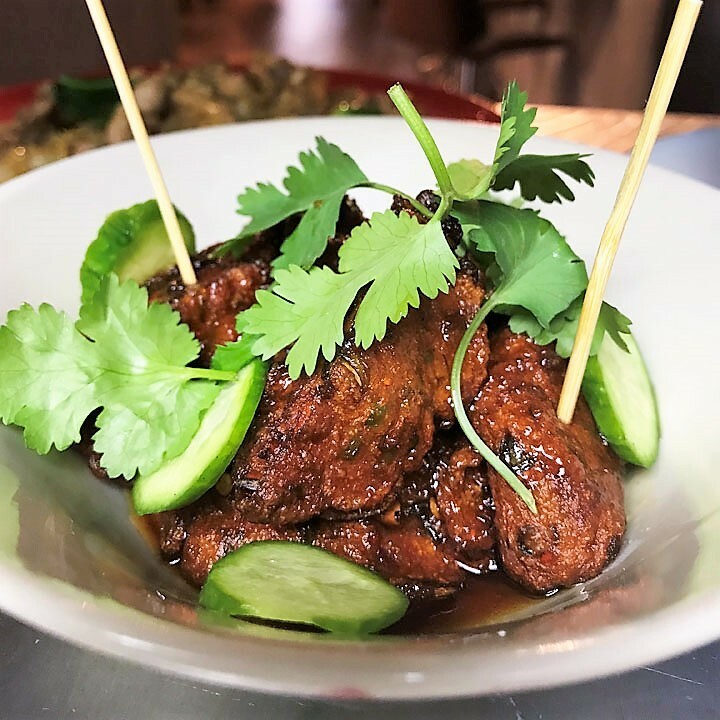 Rim Tanon offers happy hour Mondays through Saturdays from 5 to 7 p.m. All beer is $1 off, wines by the glass are $2 off and four-shot flights of housemade Ya Dong are $12. Mixed drinks like the Blood Martini and Angry Thai Street are $7 each and appetizers, including fish cakes, fried tofu and grilled meatballs, are all buy-one-get-one-half-off. Wagyu Beef and Kimchi Dumplings. Photo Courtesy of Roka Akor. Roka Akor, 2929 Weslayan: Our third Japanese entry on the list is Roka Akor, which opened last year on the bottom floor of a luxury high rise. Known for serving some of the fanciest beef around, like certified Kobe from Tajima, Miyazaki from Kyusho Island, Shiga from Hokkaido and Texas-raised Japanese Wagyu, Roka also boasts a pretty good happy hour that won’t break the bank. 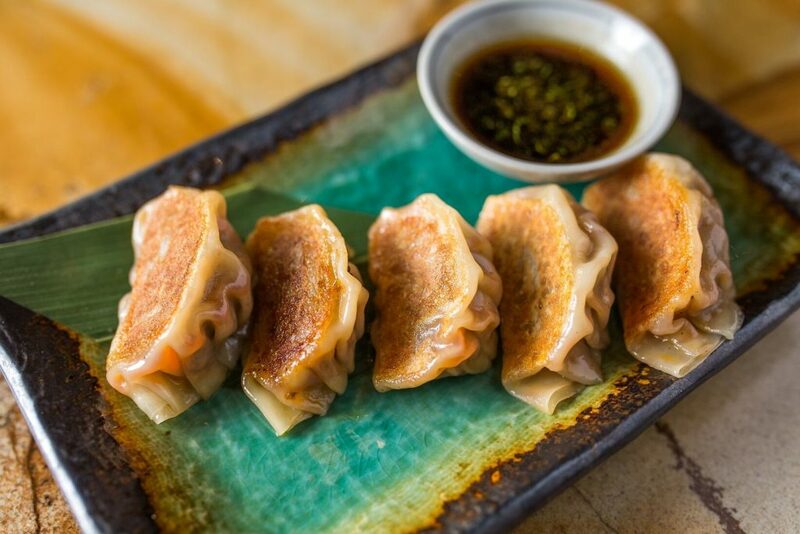 Served daily from 4:30 to 6 p.m., guests can dine on $8 deals like hamachi serrano chili roll, Wagyu beef and kimchi dumplings, tuna tartare with avocado and Taro chips, and even the Roka Chibi burger. Drink selections range from selected martinis for $8, Wither Hills Sauvignon Blanc, Alma Mora Malbec and Astoria Prosecco for $7 each, Bushido Ginjo Genshu sake for $5 a glass and draft Sapporo for just $3. Happy Hour Pizza and Wine. 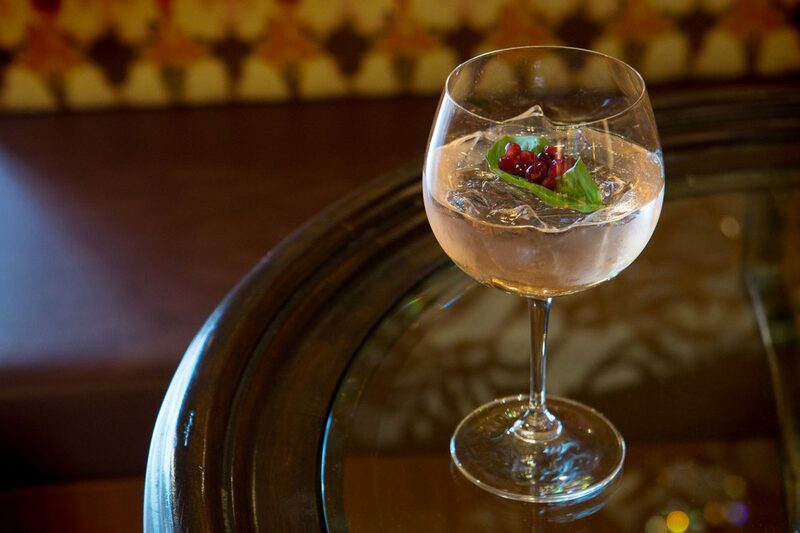 Photo Courtesy of Sonoma Wine Bar. Sonoma Wine Bar, 2720 Richmond: A favorite among wine lovers, Sonoma Wine Bar on Richmond Avenue (there’s also a Heights location, but this list is for Upper Kirby area) offers wine drinkers the chance to relax on the patio or inside on more formal seating in the lounge areas. Happy hour runs daily from open till 6:30 p.m. Drink specials include $1 off all beers (a surprisingly great selection for a wine bar) and $1 off all wines by the glass. That means house reds are all $6 or $8 by the glass, rosé is $6 by the glass and house bubbles are $8 by the glass. To eat alongside the happy hour drinks, Sonoma’s food menu includes deviled eggs for $5, heirloom tomato bruschetta for $5 and popcorn with organic butter, parmesan and chipotle seasonings for $3. Happy hour lasts all day on Mondays. Other daily specials include half-price pizza on Thursdays and $10 sommelier wine flights (that change weekly) on Fridays. Publisher’s note: as of the time of this writing, Bollo Woodfired Pizza and Sonoma Wine Bar are valued sponsors of Houston Food Finder. Our publication would not be possible without them. Editor’s note: In our pursuit of all always having up-to-date neighborhood happy hour guides, we will be updating our guides on a monthly basis. If you have new happy hour information or changes to previously published information, just email our happy hour expert Beth Levine. Update 7/12: Hops Meets Barley has closed and been removed from the list.